The former Chelsea and Arsenal midfielder still has faith in his former manager’s ability. 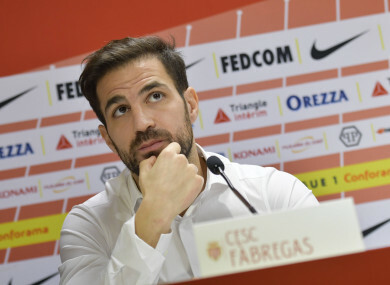 Cesc Fabregas breaks his silence over Thierry Henry's departure as Monaco manager. CESC FABREGAS BELIEVES Thierry Henry will still become a “top coach” despite lasting just three months in charge at struggling Monaco. “We are sad for ‘Titi’ because I really think he will be a top coach, I am sure of it,” Fabregas said on Monday of Henry, with whom he played at Arsenal earlier in his career. Having previously worked as an assistant coach with the Belgian national team, Henry was appointed as coach in October, breaking out on his own in management for the first time. Fabregas, who shares the same agent as Henry, left Chelsea to team up with the former France striker when he signed a three-and-a-half-year deal for an undisclosed fee on 11 January. The Spain star had played just three games under Henry before the latter was sacked last week in a stunning move by the principality club, being replaced by his predecessor Leonardo Jardim. Fabregas could be forgiven for wondering what he has let himself in for, with the 2017 French champions currently in the Ligue 1 relegation zone. “I am not going to lie, one of the main reasons for me coming to Monaco is that Thierry called me,” added the 31-year-old. Fabregas and his teammates are currently in Brittany preparing for a League Cup semi-final against Guingamp on Tuesday as they look to reach the final of that competition for the third season running. After losing 2-0 at Dijon at the weekend with Henry’s assistant Franck Passi in charge, this will be Jardim’s first game back in charge. Jardim, 44, lasted a little over four years in his first spell in charge. He was still living in the principality before making his return to the Stade Louis II, despite being linked with jobs in China and Saudi Arabia. He also claimed that he knew he would eventually return to the club, and now he is just two games away from winning more silverware. While avoiding relegation is their priority, winning the League Cup is the only way into Europe next season for Monaco, and Paris Saint-Germain’s exit from the competition has increased their chances of going all the way. PSG had won the trophy in each of the last five seasons but lost at home to Guingamp in the quarter-finals. Strasbourg host Bordeaux in the other semi-final on Wednesday. Email “Henry still has what it takes despite Monaco debacle, says Fabregas”. Feedback on “Henry still has what it takes despite Monaco debacle, says Fabregas”.